Sauvignon has been grown successfully in the western hills of Friuli for quite some time: because of the area’s unique microclimate, this grape is capable of appropriately expressing its intense aromatic nature and the hilly terrain gives the wines a pleasant mineral feel. Torre Rosazza Sauvignon opens with linden notes, followed by fruity citrus scents of grapefruit, ending with delicate boxwood notes. Savory, markedly aromatic and refreshing with a long, intriguing mineral note on the finish. Splendid when enjoyed as an aperitif, it matches well with savory seafood dishes and first course, cold-cuts and herb-filled cheeses. 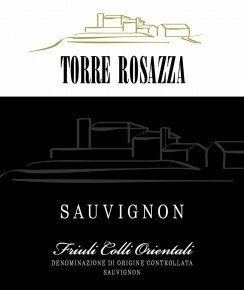 Torre Rosazza is the top winery in the Le Tenute di Genagricola portfolio. With 90 hectares of prime vineyards on two splendid, naturally-terraced amphitheaters enjoying permanent sunshine, Torre Rosazza is known for it beautifully elegant white wines. The grapes are harvested manually and are macerated at low temperatures, before being softly squeezed. Fermentation in stainless steel tanks at controlled temperature. The wine rests on yeasts for about 6 months before being bottled.